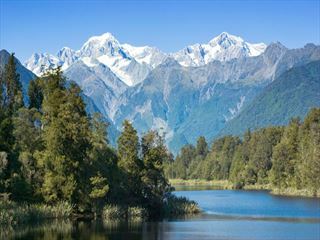 Explore New Zealand’s natural highlights on this 21-night guided tour, beginning in Christchurch and venturing through the Fiordland National Park splendours and Franz Josef Glacier thermal baths and stunning delights. 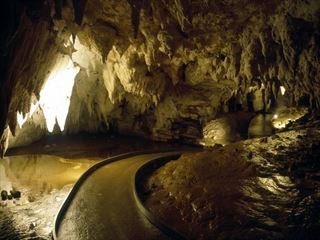 You’ll make your way north taking the ferry from Picton to the north Island ready to admire remarkable volcanic peaks, the Huka Falls & Lake Taupo, Enjoy a dazzling glow-worm show at the Waitomo Caves before spending 3-days exploring the beautiful Bay of Islands. This tour with give you a real insight into the fascinating Maori culture experiencing a traditional Hangi feast and entering the forests with a Maori guide teaching you about the local wildlife and nature (AA - NZIJ). Indulge in mouth-watering flavours at a traditional Hangi feast and concert at the Tamaki Maori Marae. Head deep into Waipoua forest with a local Maori guide, immersing yourself in the fascinating legends behind these giant trees. Welcome to Christchurch, join your travel director and fellow travellers for a welcome drink and dinner. 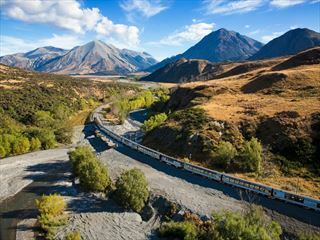 Hop on the TranzAlpine train today to traverse through the Canterbury plains with the gentle chug-chug taking you into epic scenery. Board the coach at Arthurs Pass and travel to Hokitika to meet a local artisan for a jewellery carving demonstration. For the next two nights, your accommodation will be at an eco-friendly retreat set in pristine wilderness. Perhaps relax in the Franz Josef’s geothermal hot pools. After a relaxing morning you will join a local guide to explore the surrounding area whilst they will explain the history behind the Franz Josef Glacier. Board a purpose built full enclosed river jet boat and journey down the Haast River. After a lunch stop in Makarora enjoy a visit to the historic gold-mining village of Arrowtown. The adventure capital awaits, check into your hotel in Queenstown and begin exploring on an orientation tour. Adventurers embrace the daring activities today for all those thrill seekers, time to make the most of the Adrenalin capital. The day is yours to do as you wish, if daring activities is not your thing – there is plenty else on offer, perhaps a visit to the region’s vintages on a wine tour, view the Lord of the Rings film locations or enjoy the scenery of Queenstown and Glenorchy on a scenic tour. Today spend at leisure – a round of golf, an exhilarating ride on a jet boat or simply relaxing with a spa treatment – the day is yours to choose. 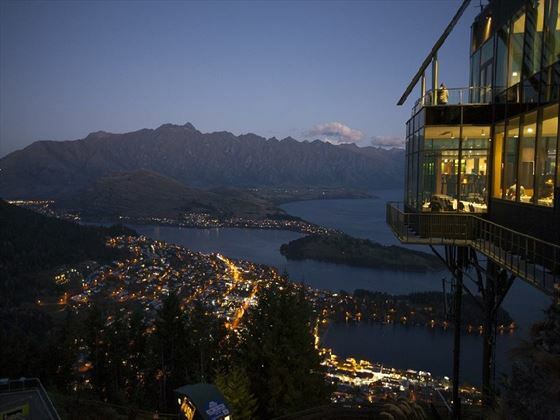 This evening, enjoy a memorable Local Dining Experience at one of Queenstown’s fine dining restaurants. Today you’ll head toward Milford Sound Lodge – visiting Te Anau and then journeying deep within the Fiordland National Park. Drive through the hand-hewn Homer Tunnel and emerge into a photographer’s paradise where glaciers and peaks give way to the unexpected beauty of Mirror Lake. You’ll stop to explore the wonder of the Chasm Walk before arriving at your lodge for the next couple of evenings, with its exquisite views of the Cleddau Valley. 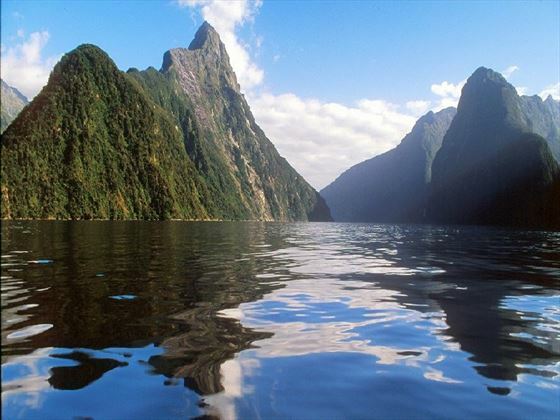 Wake up to the startling beauty of Milford Sound. This morning, join a nature guide who will share their knowledge of the fiordland and the wildlife. Board the Southern Discoveries vessel for a half day exploration of Milford Sound. Sail out to the Tasman Sea looking for wildlife and an opportunity to go sea kayaking in Harrisons Cove. Embark on a journey this morning from the rainforests of Fiordland through Te Anau and the rolling the hill country of Southland to the hills of Central Otago. A stop in the musical town of Gore at lunchtime before arriving in Dunedin, New Zealand’s southernmost city. This morning you will join an exclusive tour of Larnach Castle, New Zealand’s only castle. This afternoon is at leisure, perhaps ride the historic Taieri Gorge Railway or take a wildlife cruise. 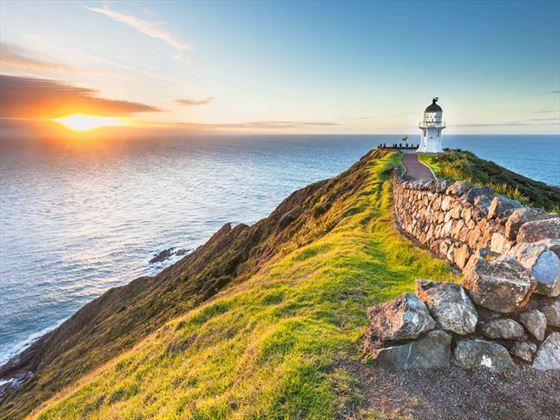 Travel up the east coast through Oamaru, famous for its white limestone buildings before arriving in Christchurch for an in-depth sightseeing tour. Against the backdrop of snow-capped peaks, you’ll arrive in the whale-watching capital of Kaikoura. Consider a scenic whale watching flight (own expense). Continue to the picturesque port town of Picton, the launch pad for a serene sailing across the Cook Strait to Wellington. Spend your day delving into the coffee culture and gourmet delights of Wellington – consider a cable car ride for a bird’s-eye view of the city – today is yours to enjoy the city on your terms. Travel through the dairy farm land of Manawatu to Napier in Hawke’s Bay. Enjoy a relaxing afternoon before joining your group for dinner at the hotel. Enjoy a relaxing morning before venturing out to explore Napier with a local guide for a city tour, where you will see several types of Art Deco architecture which is the style in which the city was rebuilt after the devastating earthquake in 1931. The evening, enjoy wine tasting and dinner at one of the region’s renowned wineries. Travel past Lake Taupo and visit the raging Huka Falls before arriving into Rotorua, the cultural capital of New Zealand for a sightseeing tour. Visit Whakarewarewa Living Village for insights into the lives of the Maori community and their special bond with this ancient land. Tonight, indulge in the mouth-watering flavours of a traditional Maori Hangi feast and concert at the Tamaki Maori Marae. Your first stop today is Rotorua’s natural splendour – revealed in the crystal clear mineral springs and native flora of Rainbow Springs Nature Park. Enjoy a behind the scenes tour of the National Kiwi Hatchery Aotearoa, where over 1,800 kiwi chicks have been hatched to date. Learn about the efforts of the kiwi husbandry team, discover what it takes to hatch a chick, and if you are really lucky see baby chicks in person! Later, ascending to the Redwoods Treewalk, enjoy an elevated bird’s eye view of these redwood giants from 23 suspension bridges. Enjoy an afternoon at leisure. Begin the day with a dazzling show during an exclusive five-star Eco Glow-worm experience. Later, get your bearings during a city tour of Auckland and then enjoy the rest of the day at leisure discovering why it’s deemed one of the world’s most liveable cities. The golden sands of Orewa seem to stretch endlessly heading north to the native forest of Waipoua. Join a local Maori guide and head deep into the forest, immersing yourself in the fascinating legends behind these giant trees and the history. Finally, journey to your waterfront resort in the Bay of Islands. Enjoy the day exploring the Bay of Islands. Why not sail aboard a historic tall ship, discover Russell on a tour or enjoy wine tasting around Kerikeri. 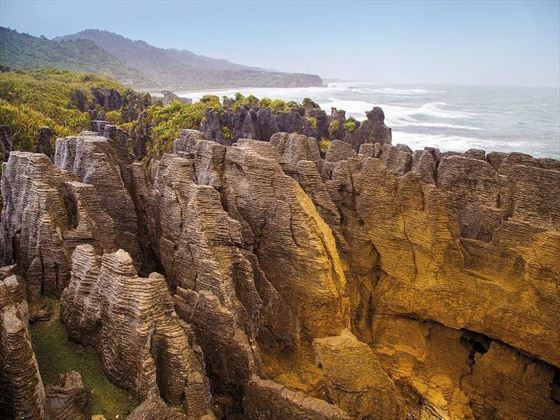 Set forth across the Bay of Islands and explore some of the 144 islands by cruising to the Maori’s sacred Hole in the Rock to witness how it resists the power of the sea. Return to Auckland for a memorable Farewell Dinner. Bid a fond farewell to your group as your epic New Zealand Inspiring Journey has come to an end. Please note that the availability changes with new departure dates added and other dates fully booked. We'd recommend calling one of our consultants to double check availability for you as new dates may be added/ fully booked due to popularity.